I’ve just been to New York for Tea, the only painting by James Tissot on display in the city – and the state. Tea (1872), oil on wood, 26 by 18 7/8 in. (66 by 47.9 cm), was one of Tissot’s eighteenth-century paintings calculated to appeal to British collectors once he had moved to London in mid-1871, following the Franco-Prussian War and its bloody aftermath, the Paris Commune. Tissot’s great friend, Edgar Degas, owned a pencil study for Tea. Tea is a version of another of Tissot’s oils from 1872, Bad News (The Parting), now in the collection of the National Museum of Wales, Cardiff. Tea was in a private collection in Rome, Italy in 1968. It was with Somerville & Simpson, Ltd., London, by 1979-81, when it was consigned to Mathiessen Fine Art Ltd., London. The painting was purchased from Mathiessen by Mr. and Mrs. Charles Wrightsman, New York. Socialite, philanthropist and fine arts collector Mrs. Charles Wrightsman was elected to the Met’s Board of Trustees in 1975. Upon Mr. Wrightsman’s death in 1986, the collection became her sole property. 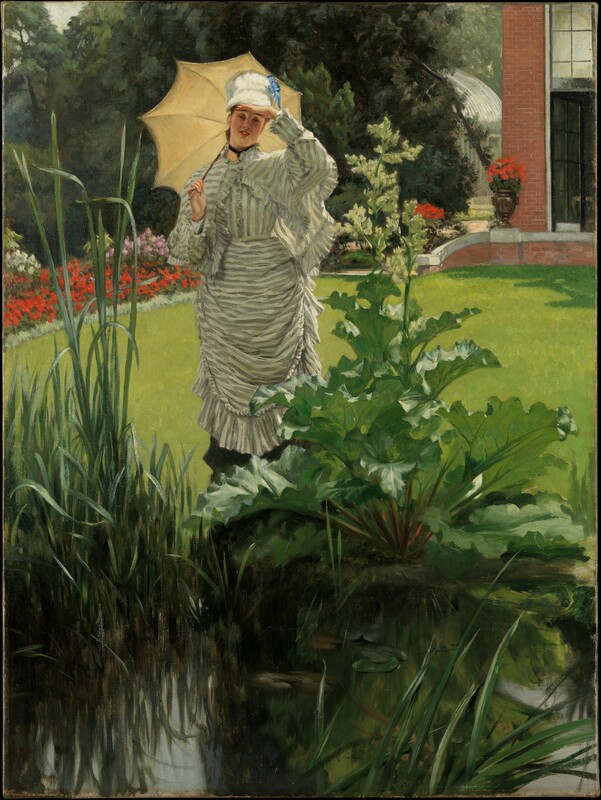 Mrs. Wrightsman owned Tea until 1998, when she gifted it, and eventually three other Tissot oil paintings, to the Met. Though the Met’s collection included these four Tissot oils between 2006 and 2013, none was displayed. En plein soleil (In the Sunshine, c. 1881) was purchased in 1983 by Mr. and Mrs. Wrightsman. Mrs. Wrightsman kept the picture until 2006, when she gifted it to the Met. Spring Morning (c. 1875) was purchased in 1981, as Matinée de printemps, by Mr. and Mrs. Wrightsman. Mrs. Wrightsman gifted it to the Met in 2009. In the Conservatory (Rivals) was purchased by the Wrightsmans in 1981. Mrs. Wrightsman gifted Rivals to the Met in 2009. Inexplicably, this major work among the Tissot oils donated to the Met by Mrs. Wrightsman was deaccessioned in 2013. When I wrote, “New York, New York! It has everything – except paintings by James Tissot that you can see,” in Tissot in the U.S.: New York (December 10, 2013), the Met still was exhibiting none of its Tissots. Tea was put on display in 2014. Tea includes Tissot’s beautiful and deftly painted surfaces: the wood table, silver tea service, porcelain, the flocked fabric of the woman’s gown and her black lace mitts. Here are some close-ups from my visit for you to enjoy! Below, you can compare Tea and the left side of Bad News (The Parting). While at first glance they look identical, there are many differences: the position of the wooden blinds, the scenes outside the windows, the shapes of the silver trays, the coffeepots, and the urns, the placement of the cakes and the chairs, and the style of the wooden tables. As always with Tissot’s oil paintings, there is more than meets the eye. © 2018 Lucy Paquette. All rights reserved. This entry was posted in Art blog, Art History, Impressionists and tagged James Tissot, Jayne Wrightsman on September 16, 2018 by Lucy Paquette, author of The Hammock: A novel based on the true story of French painter James Tissot.